The internal measurement from the bottom of the cistern to the top of the cistern lid/ countertop needs to be - 333mm MAX or 258mm MIN. Which one is the fill valve in my toilet cistern? Knowing what the part are in a toilet cistern shouldnt worry you. FlushKING has created a How-to guide to help you idenify which part is the flush, and which is the fill valve. You can find out what a fill valve is here. This how to guide should answer your problem. What is stopping my toilet cistern from filling up? A toilet cistern not filling has a few possible causes. This possible fault list should answer your question. Which one is the Flush Valve in my toilet cistern? 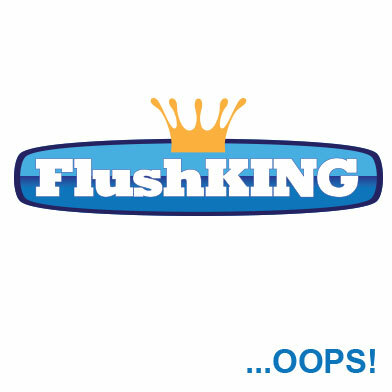 FlushKING has created a How-to guide to help you idenify which part is the flush, and which is the fill valve. You can find out what a flush valve is here. Why isnt my toilet flushing properly? Your toilet not flushing properly? It could be a number of things stopping it, but dont worry, FlushKING already has a guide to why your toilet isnt flushing. This how to guide should put you on the right track. Why do I need a dual flush valve in my toilet cistern? The use of a dual flush valve is the only way to go. Here at FlushKING we have already created a How to Guide for this, so please, take a look at our What is a dual flush guide. What would cause my toilet to overflow? An overflowing toilet is not something to ignore!